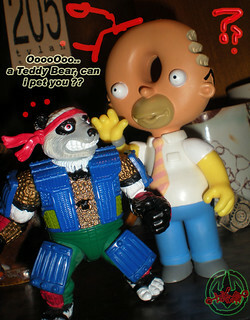 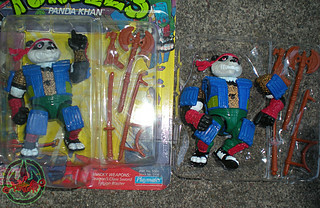 –>> A properly packaged Panda Khan is presented here ..
and here we have a P.K. 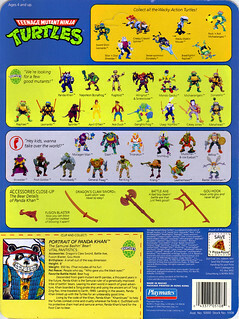 “SCRAMBLED VARIANT”. 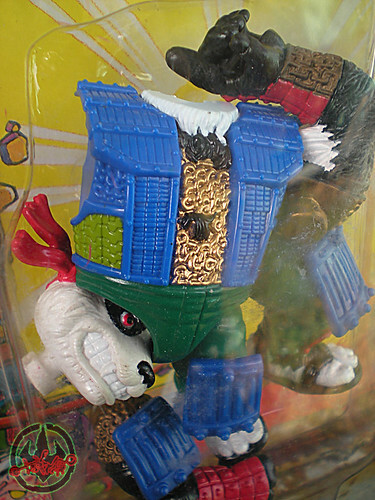 Not a “REAL” variant, but an unusual case of scrambled parts in a MOC package. 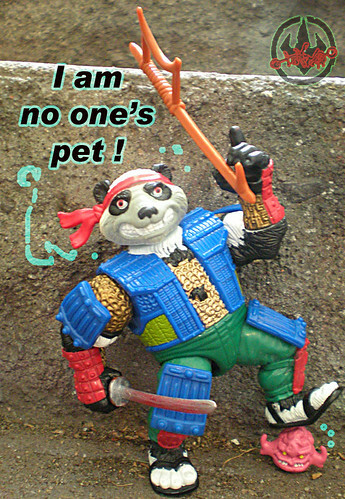 Li Yang’s broken appendages appear all over the insides of this plastic bubble either courtesy of Krang’s pan-dimensional brain scrambler device or one of Lord Shibo’s evil body-part mash-up spells. 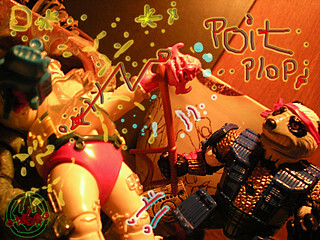 This was received courtesy of P.K.’s courtesy of Li’s co-creator; Monica Sharp. 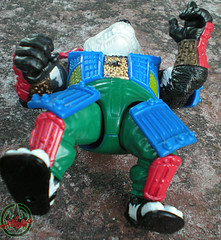 And it would appear the real culprit of this “variant” is poor assemblage. 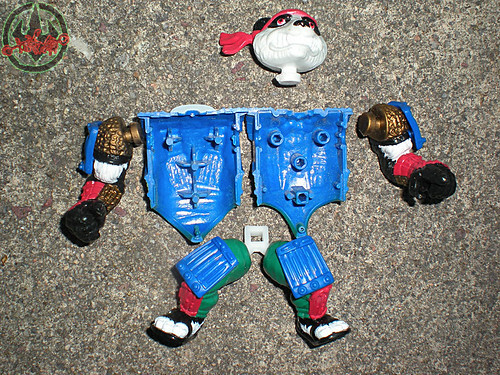 After Li left the factory – stress and settling during shipping just sent him all to pieces. 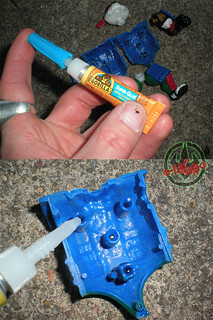 This really breaks Tokka’s heart so i’ve set to repair him. 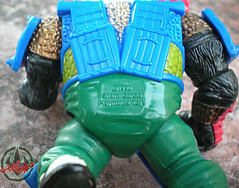 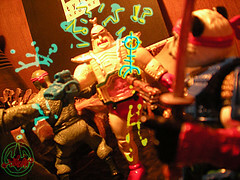 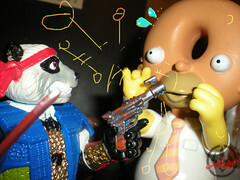 Plus it gives us a brief glimpse at the inner workings of the construct of a vintage TMNT figure. 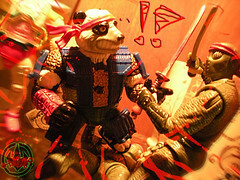 Descended from giant mutant Earth pandas, a thousand years in the future, Panda Khan is the Samurai ruler of a genetically improved tribe of battlin’ bears. 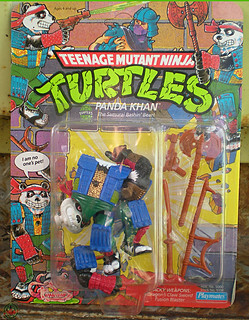 Leaving his alien world in search of great adventure, Khan boarded a Tong pirate ship and using the ancient art of Ting Zing Pao, time-traveled to Earth, 1990. 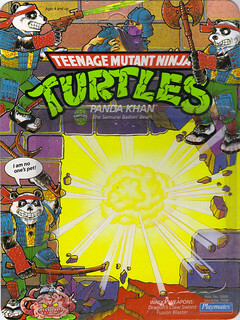 Landing in the sewers, Panda Khan linked up with the Turtles for an unbearably good time. 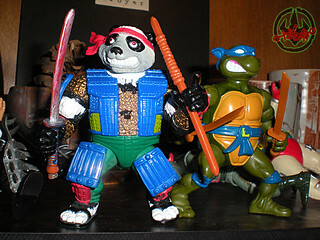 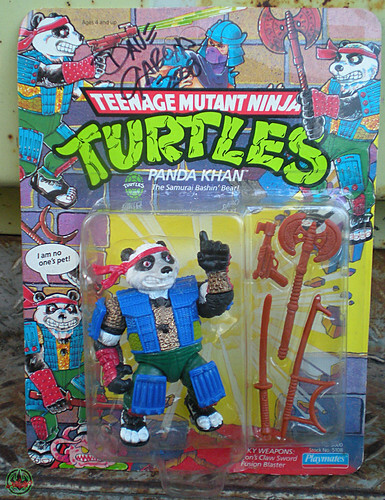 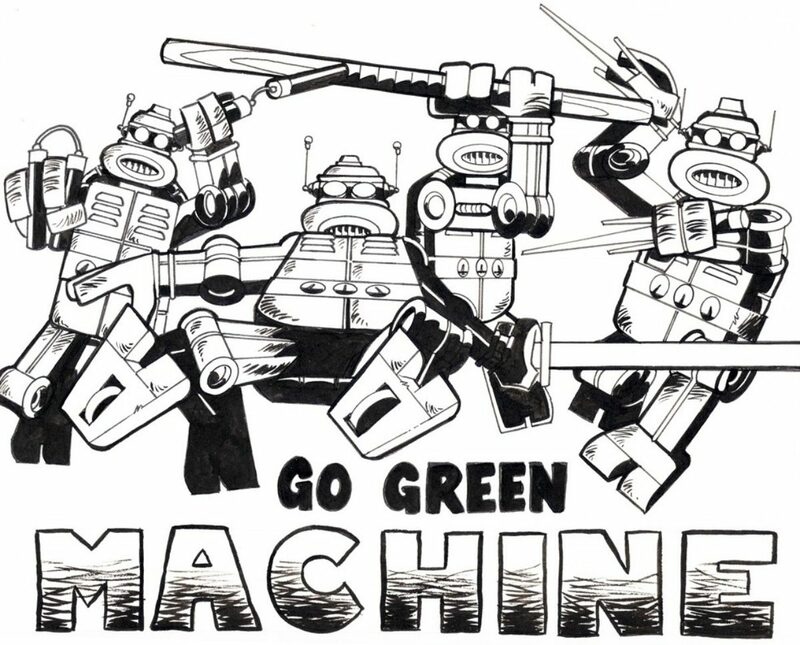 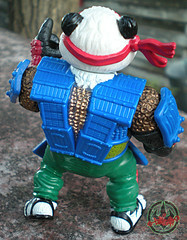 Living by the code of the Khan, Panda Khan “Khantinues” to help the Turtles combat crime and cruelty wherever he finds it. 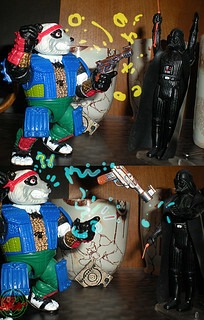 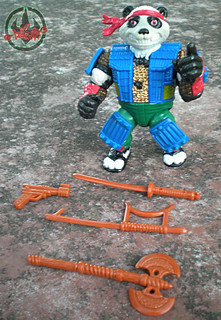 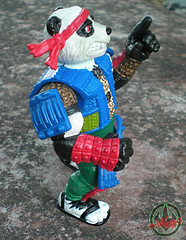 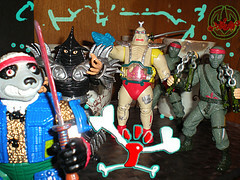 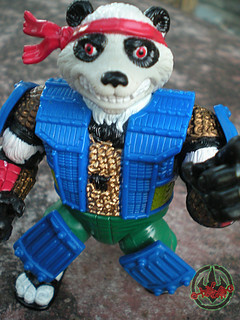 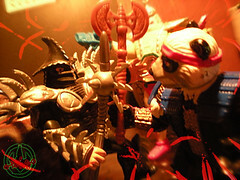 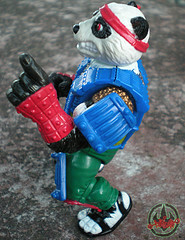 Outfitted with his protective chain mail and samurai armor, Panda Khan’s hard for the Foot Clan to bear.